The Mind Museum opens a special exhibition that will make you ponder about your relationship with the planet on April 25, Friday. First launched in 2013 at ArtScience Museum in Marina Bay Sands in Singapore, The Apocalypse Project is a the brainchild of Catherine Sarah Young, an artist, scientist, designer, writer and explorer whose work combines the arts and the sciences to create stories, objects and experiences that facilitate wonder and human connection, thus allowing these 5 exhibit stations to bring out emotional connections with what we are losing and gaining in the context of climate change. Catherine has a degree in molecular biology and biotechnology from Mania, as well as a fine art education from Barcelona and was a Fulbright scholar from the School of Visual Arts in New York. 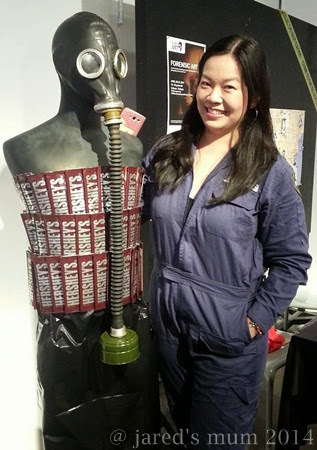 She was a correspondent for the Philippine Daily Inquirer for six years, and is currently participating in an Art Science Residency Programme in partnership with ArtScience Museum, Tembusu College National University of Singapore and the Singapore-ETH Centre’s Future Cities Laboratory, working on the theme Climate Change and Environment Futures. The exhibition, which allows exploration through the senses such as smell and sound, clothing, and habitat that can be investigate through objects, interactive exhibits and participatory art, will be located in the Technology Gallery of The Mind Museum beginning 25 April, 2014. 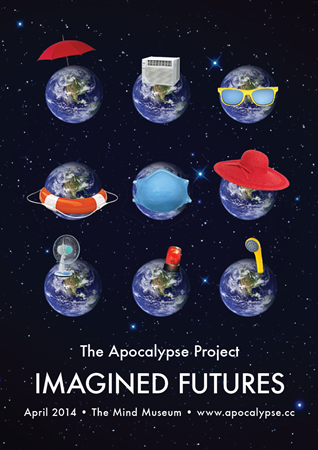 The Apocalypse Project, along with a bevy of other equally interesting exhibits, is one perfect way to bond with your children this summer. Not only will you be allowing them to learn, but the experience will also teach them about loving Mother Nature more as we face and help combat climate change. To know more about The Apocalypse Exhibit and the other exhibits and summer activities at The Mind Museum, you may refer to my post here or you can always visit The Mind Museum website, www.themindmuseum.org. 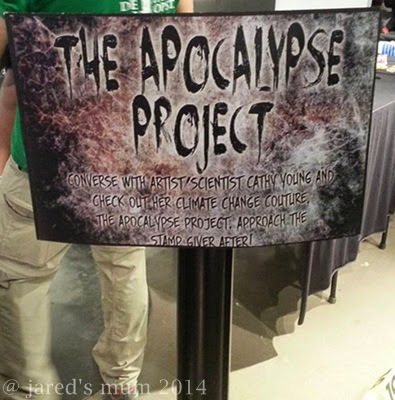 You may also visit The Apocalypse website, www.apocalypse.cc. 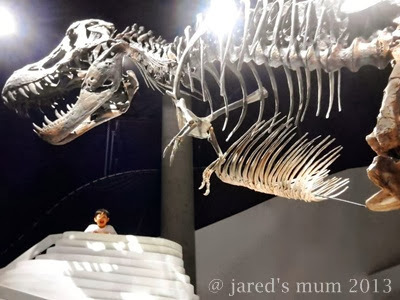 This entry was posted in educational places for children to visit, event, travel and tagged exhibits, museums on April 24, 2014 by Mum Travels. In celebration of one of National Heroes, Gat. 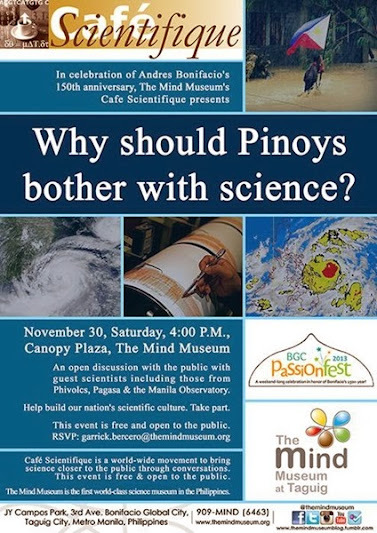 Andres Bonifacio’s 150th anniversary, Mind Museum’s brings you Cafe Scientifique’s Why Should Pinoys Bother With Science, an open discussion with the public with guests scientists from Phivolcs, Pagasa, and the Manila Observatory. This event is also in line with Bonifacio Global City’s PassionFest. Cafe Scientifique is a world-wide movement that aims to bring science closer to the public through conversations. 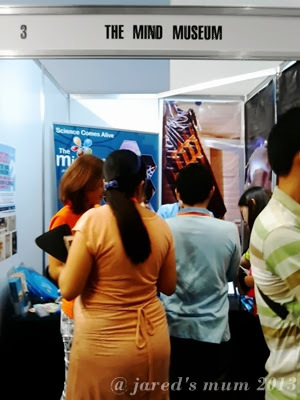 Happening at the Canopy Plaza of the Mind Museum on Saturday, 30 November, 2013, this is the public’s chance to take part in helping build our nation’s scientific culture. This event is open to the public, if you are interested to join, kindly RSVP to garrick.bercero@themindmuseum.org. This is a perfect weekend activity for the family, in case you have not made plans for the weekend yet, and a perfect way to cap November, too! This entry was posted in educational places for children to visit, travel, Where-to-Weekend and tagged museums on November 25, 2013 by Mum Travels. Visiting museums in my opinion is one of the most ideal activities to do with our little ones, and it is never too early tag along our children for a day of exploration, wonder and surprises. 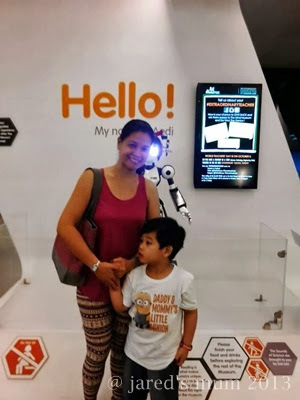 The Mind Museum has been on the top of my travel destinations list ever since I heard about it a year ago, that is why I was really thrilled when we get to finally visit the place when we joined last October’s Mom & Me Fun Circuit! We have visited a handful of museums in the past but I think the Mind Museum is the one that appeals to my little man the most. It also stands out from its contemporaries and this is thanks to the humongous 40-foot T-Rex dinosaur that will greet you as you enter the main museum area, not to mention the robot Memo who will graciously greet you at the entrance. Upon entry, we are immediately ushered to one of their 3D theaters to watch the Birthplace, which is a flashback to 4.6 billion years of Earth’s natural history. The 3D film lasted for about 12 minutes. The Mind Museum is a project of the Bonifacio Art Foundation, Inc., a non-profit organization. All ticket purchases and donations go to the maintenance and improvement of the Museum and its exhibits, plus help subsidize the entrance fees of teaches and public school students. 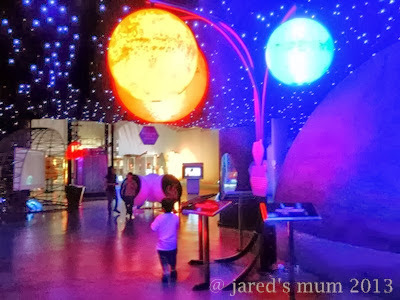 The museum is divided into 5 main galleries, the Atom Gallery, Life Gallery, Earth Gallery, Universe Gallery and Technology Gallery and we joined other mom/dad and kids pair as we explore every nook and cranny. One of my boys’ favorite is that part of the museum with game consoles where they get to try a bunch of games. Jared was also fascinated with the mini billiard table as he saw a game on the telly recently and he cannot wait to give it a shot. 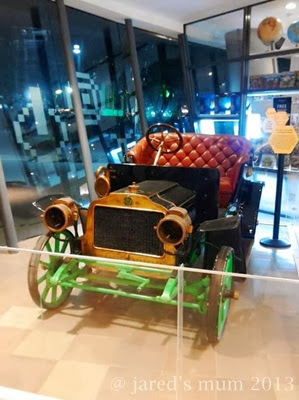 He also enjoyed the miniature cars and other vehicles, as well as the Phase of the Moon exhibition where you get to view the different phase of the moon at a touch of a button. I, on the other hand, enjoyed the miniature displays about food, electricity, recycling among other things. I love the details and the love those who crafted these displays put into their projects. I also had fun peeking at the kaleidoscope and can barely keep up on how many colors I have actually seen there. We also take a quick visit to the Museum’s shop and saw a lot of animal figures and other souvenirs up for sale. They also have a bunch of beautiful 3D postcards on display, which I would’ve been able to check out more if I wasn’t busy running after my little man who simply wants to touch everything he saw! Visitors can also enjoy the wonders of nature in the Science-in-the-Park wing, which we unfortunately missed as we arrived to the place after sundown. I would love to check this out with my little one next time, though. Did I mention you are free to take as much photos as you want? So I went ahead and snapped as many shots as my mobile camera can take. What can I say, I love taking photos, especially of beautiful places! Incidentally, Mind Museum was one of the businesses featured in this year’s Blogapalooza. 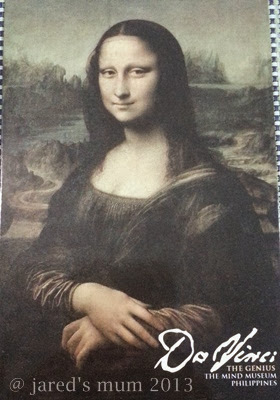 They have a number of museum memorabilia up for grabs for the blogger attendees and I was delighted to take home a couple of these beautiful Da Vinci postcards. If you are planning to go out with your little ones over the holidays, you might want to bring them to the Mind Museum. I am sure they will enjoy it as much as my little man did! The museum operates from Tuesdays until Sundays from 9AM-12NN, 12NN-3PM and 3PM-6PM. Tickets are sold at Php600 for adults and Php450 for children and students. Public school students and teachers can get admission tickets at only Php150. This entry was posted in educational places for children to visit, travel and tagged museums, travel + children, travel destination on November 23, 2013 by Mum Travels.